I'm an avid crafter who loves reading, writing, and making things with my hands! I run PeachPod, a handmade shop on Etsy. The most common animals kept as pets are medium sized mammals such as cats, dogs, and rabbits. These warm, furry animals make great pets! But there are other options for pet lovers interested in a more exotic animal companion. Reptiles, though not as easy to care for as mammals, can make fascinating and rewarding pets for those willing to take the time to learn about them. While there are many reptile species that can be kept in captivity, such as turtles, lizards, and chameleons, one of the best species to start out with is the Corn Snake. For pet lovers curious about the more scaly members of the animal kingdom, a corn snake can make a great starter reptile. house and safe to handle. With proper care, these snakes can live to be about 20 years old in captivity. Most people think of snakes as being dull green or brown, but some species can display a variety of colors. Corn snakes are some of the most colorful reptiles out there! Their natural wild coloration is quite vivid, consisting of a yellow-orange background with splotches of bright orange rimmed with black along their backs. Years of captive breeding have produced even more color schemes. The "Snow" variety is almost pure white, "Charcoals" are various shades of grey, "Caramels" are a rich yellow, and "Lavenders" are, you guessed it, lavender! Interesting patterns have also been bred into captive snakes. "Motley" snakes have the splotches on their backs changed to round spots, "Striped" varieties have long solid stripes down the length of their bodies, and "Aztec" snakes have a randomized pattern reminiscent of ancient Aztec designs. There are literally dozens of different color and pattern combinations to choose from, and more are being created every year. Most mammalian pets are easy to care for, because their requirements are very similar to ours. A dog or cat is usually perfectly comfortable in the same environments as their human family, so no special arrangements have to be made. Reptiles, on the other hand, often require specific traits in their habitats, such as precise temperature or humidity, in order to be healthy and comfortable. Luckily, corn snakes are very easy to please! Their needs are more broad and general than most reptiles, making them easy starter pets. A basic corn snake setup consists of a terrarium, usually made from a glass aquarium of 10 gallons for a baby and 20 gallons for an adult. A tightly fitting lid is needed to prevent escapes. The bottom should be covered with a substrate such as wood chips or shredded newspaper to soak up urine. One corner should have a sturdy water bowl, both for drinking and for bathing, as snakes will sometimes curl up in their water dish to cool down or to help with shedding. Corns love to hide, so small boxes or containers scattered around the terrarium provide cozy hiding places to help them feel secure. Unlike some reptiles, corn snakes don't require a special UV light in their habitat. The most important part of the habitat is a heating pad. Snakes are cold blooded, meaning they cannot automatically regulate their body temperature like most animals can. A special heating pad made just for reptiles helps them warm up when they need to. The pad should be placed at one end of the terrarium, so that the habitat has a warm end and a cool end that the snake can choose from as its needs change. A corn snake habitat can be set up relatively quickly, easily, and inexpensively. It will need to be cleaned on a regular basis every few weeks or so, but is otherwise fairly low maintenance. In the wild, baby corn snakes start out eating small lizards and frogs, then graduate to eating rodents in adulthood. They kill their food by constriction, squeezing it until it suffocates and then swallowing it whole. In captivity, most snakes are fed mice. They are usually good eaters, and don't require any special coaxing to eat their meals. Frozen mice can be purchased in quantity from a variety of sources at very affordable prices, and thawed out as needed. Usually all that is required for feeding is to place the mouse near the snake, and instinct will take over! Corn snakes don't require daily feeding; usually a mouse or two per week is sufficient. After feeding, they will usually spend the next day or so lounging around on the heating pad, using the warmth to help digest their meal. It's important to resist the urge to feed your snake too frequently. Though it's fascinating to watch a snake eat, overfeeding can result in obesity and other health problems. Many people are afraid of snakes, believing them to be aggressive and dangerous. This is definitely not true of the corn snake. 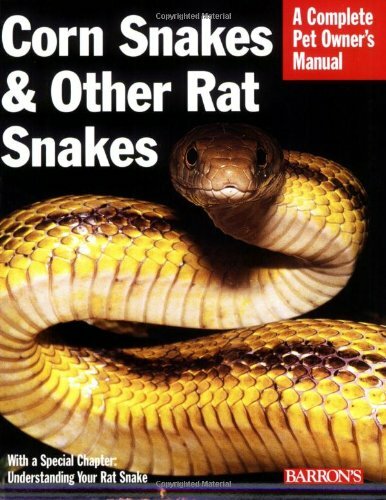 They are small and non-venomous, so they pose no threat to humans or other pets. They are welcomed on farms as helpful allies, because they eat rodents that cause damage to crops and grain stores. Baby corn snakes are usually skittish, because in the wild they would be easy prey for predators such as cats and birds. They often mellow out as they grow, becoming calmer and more tame as they reach adulthood. Corn snakes are easy and safe to handle. Unlike larger snakes like boas, they usually won't lay peacefully on your shoulder...corn snakes like to move! They are active and love to slither around and explore, making them entertaining pets. Frequent gentle handling ensures that your pet corn snake stays calm and tame around humans. Owning reptiles can be very fun and rewarding. Corn snakes are easy keepers, making them excellent starter pets for people wanting to learn how to properly care for a reptile. Their friendly personalities and bright colors make them fun pets for children and adults alike!